Quick update on December. My sewing activities have consisted only of making these few stockings–actually there are three more–two for the parents and one for a friend with a newborn. These stockings were made with the AccuQuilt stocking die (Studio). Love that die as the stockings turn out perfectly and are so quick and easy. They are unlined, except that I cut four pieces for the cuff and lined the cuffs which make them much more stable for holding the machine embroidery. The snowflakes have been in my files for many years–not sure their origin, but think it may be Embroidery Library. The lettering was done with my Art & Stitch Plus software—that works so well to adjust lettering to get all the names in the same space. My stitching has been so limited because of the arthritis in my hands. Thought I would do some baking, but found that worked quite well except that using a cookie scoop for portioning and especially the cookie press are not easy with these hands. Maybe machine embroidery will be my focus for awhile. Christmas is only a week away. Are you ready? This blog post was published on the AccuQuilt blog yesterday and has the machine embroidery for the lowercase alphabet die that was recently released as well as my Holiday Elements machine embroidery design set. As always, if I made this again, I would make snowflakes that showed up just a bit more—a darker thread for the stitches around them would give that little bit of additional contrast that is needed. But I absolutely love those cute snow people as well as the lettering. This is stretched on a 20″ x 24″ canvas frame and has batting underneath, but does not have quilting stitches through the layers. This is a quilt tutorial that I wrote for AccuQuilt for their blog. It was a lot of fun, but is very simple to do. The Spring Medley applique is cute, but this can also be made with a lot of the other different applique dies. I used the 10″ Qube, but it will also work with the 9″ and the 12″ blocks too. AccuQuilt has another new die–they just keep releasing more and more–it’s hard to keep up with trying out each new one. This one is a Bear’s Paw die that is a Block on Board (BOB) which means one run through the cutter and you have a complete block ready to stitch. The quarter block of the Bear’s Paw looks like a maple leaf so I used that idea to make this table runner. You can go over to the AccuQuilt blog to see the full tutorial. I just finished this Crazy Quilt Star Throw Quilt made with the AccuQuilt GO Crazy Quilt die. 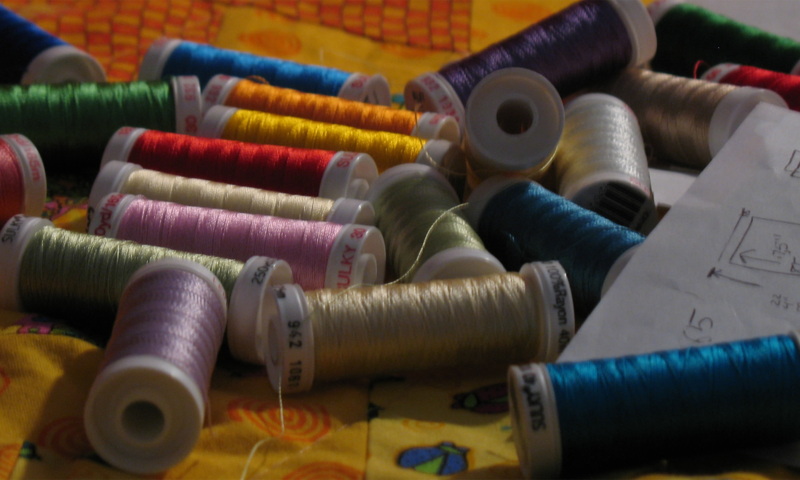 I love the Crazy Quilt dies (both Studio and GO!). They are just incredible. There are so many different layouts that one can create with it–and the blocks stitch up faster than almost any other block. I used Square in a Square (aka Economy Block) blocks alternating with Crazy Quilt blocks. Read the full tutorial on the AccuQuilt blog. The new 10″ Qube die set from AccuQuilt is a great size because multiples of 10 are so easy to make. And there’s no math to think about. Obviously 1/4 of 10 is 2.5 which is not an even number—but with the Qube set, there’s no math involved except the finished size of the quilt. This is a tutorial I wrote for the AccuQuilt blog. And this is a picture of the quilt. I really loved making this. The blocks are simple even though it looks much more complex than it is. I’ve had a lot of fun this year doing projects for AccuQuilt. Here’s a blog post published on the AccuQuilt.com website for the new Pineapple Block on Board (BOB) die. The Pineapple block is not one I would have chosen to make but with the new die and the way it’s laid out, I can see many more pineapple blocks in my future. This made a quick and easy table runner. You will find the tutorial here on the AccuQuilt blog. The 10″ Qube Mix & Match along with the 10″ Qube Companion Angles made this quilt incredibly fast and easy. And I love, love, love the Watermelon Collection (by Daniela Stout) Fat Quarters from Timeless Treasures. This quilt is made with rectangles and triangles—both of which go together with great ease. The full tutorial can be found on the AccuQuilt blog. Imagine how this quilt would look in a different colorway—think Christmas OR Spring! One of the really cool things about the 10″ Mix & Match Qube set from AccuQuilt is the easy layout using 10″ blocks. The center of this quilt is four blocks–YES–only four. And with a strip border and some five inch blocks (half of a 10″ block) you suddenly have a wonderful 40″ x 40″ quilt. This tutorial will take you through the steps. You will find it here on the AccuQuilt Blog. With 10 grandchildren, one has to start early with Christmas gifts. My two favorite things to make are pillow cases and Christmas stockings. With the new and updated AccuQuilt Studio Christmas stocking die, making stockings is a breeze. Here are the ones I started with a tutorial on the AccuQuilt blog. I made some solid color ones with names embroidered and I made some generic patchwork stockings without names. These will be a lot of fun for all. And they’re plenty big enough to be stuffed with lots and lots of goodies.